Maintain & operate this authentic Carousel so that many can enjoy this nostalgic and affordable form of entertainment. Support the on-going maintenance of the band organ, pavilion and painting of both the animals and the Carousel. Continue to play an active role in activities such as “Clowns at the Carousel” (all free family event), Cruise to the Carousel car show, art education activities with other non-profit programs serving children (in conjunction with the Iowa Arts Council), providing discounted usage fees to school groups and non-profit organizations. 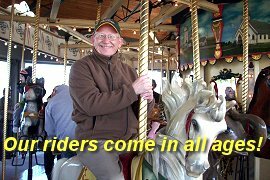 FRIENDS of the Heritage Carousel Program - Coming Soon!